Centrepoint is the UK’s leading charity for homeless young people aged 16-25. Centrepoint supports more than 10,000 homeless young people a year directly in London, Manchester, Yorkshire and Sunderland, and through partner charities across the UK. 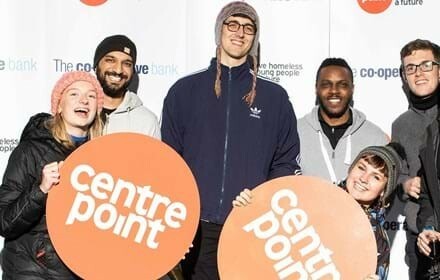 Centrepoint’s work is about more than just providing a safe bed for the night; Centrepoint helps young people to turn their lives around by gaining essential life skills; tackling their physical and mental health issues and moving into education or employment. Homeless young people stay with Centrepoint for up to two years, but we keep supporting them for another six months to make sure they can live independently. Centrepoint also runs the free-phone Centrepoint Helpline for any young person aged 16-25 who is worried about homelessness. The Centrepoint Helpline is open Monday to Friday from 9am to 5pm and the number is: 0808 800 0661. 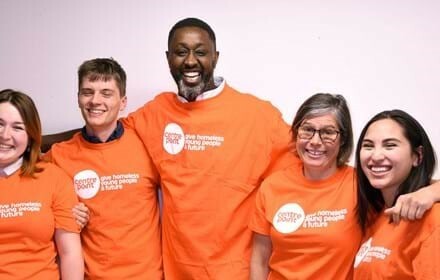 Through policy work, Centrepoint aims to influence public policy, campaigning on behalf of the young people it supports and homeless young people throughout the UK. HRH The Duke of Cambridge became Centrepoint’s Patron in 2005. St Botolph Building alongside all the pop-up vendors we invite in the building we help young homeless people. 10% of sales from every pop-up event that we hold in the Building go to the charity. We would like to thank you for your constant contribution and help. We invite you all to contribute to this cause, together we can help vulnerable young people by giving them the practical and emotional support they need to find a job and live independently. The stats for homeless young people are shocking. Did you know that Centrepoint research revealed that in 2017/18, an estimated 103,000 young people approached their local authority because they were homeless or at risk of homelessness? We can’t give homeless young people a future without your help. By volunteering, donating, fundraising or simply helping us spread the word about our work, your support will make a huge impact. Visit their website on https://centrepoint.org.uk/ and join the St Botolph Building Team this year on the quest to support this cause. Click here to visit our Just Giving page and support our cause.